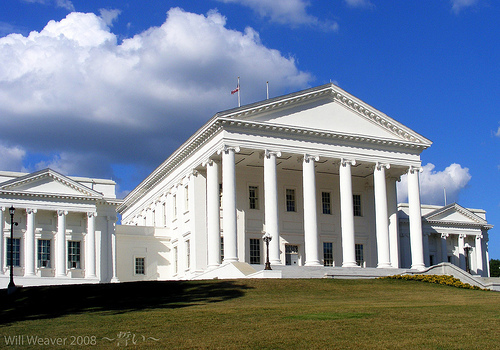 There is a budget impasse in the Commonwealth of Virginia and it has nothing to do with budget issues such as state spending or tax policy. No, the Democrats are now obstructing a budget plan that was constructed through bipartisan collaboration and cooperation in an effort to reorganize some committees to give their party more power. Democrat Senators Richard L. Saslaw and A. Donald McEachin are asking for more seats on crucial committees. They have also requested that the powerful Senate Finance Committee be co-chaired by a Republican and Democrat. The current stalemate is set up by an intricacy within the Virginia Constitution that requires the votes of 21 senators to pass a budget. The lieutenant governor cannot cast a tie-breaking vote. With 20 Republican senators and 20 Democrat senators, passage of the budget requires bipartisan cooperation — and the Senate had been working cooperatively. The Senate plan includes countless amendments that were introduced by Democrats and reflects the top priorities they have publicly expressed. Indeed, the spending plan constructed by the Senate Finance Committee can be fairly characterized as the most bipartisan budget proposal advanced in recent history. Democrats objected to increasing the portion of the sales tax dedicated to transportation. They objected to what they saw as an inadequate level of funding for education. They were concerned about funding levels for Medicaid. All of these concerns were addressed in favor of Democrats, with the Senate incorporating their stands into the budget. No additional sales tax revenues are being redirected to transportation, public education is funded at higher levels than achieved in recent budgets passed during Democratic control of the Senate, and health care was funded at a level higher than either the governor’s or the House’s budget proposal. McDougle also cautions that allowing budget negotiations to revolve around issues entirely unrelated to the budget could set a dangerous and lasting precedent, creating potential for the budget to be held hostage every year due to unrelated legislative disputes. Some may ask, if the Senate is split 20-20, why not share power? Well, truth be known, despite the even split the voters of Virginia actually gave a mandate to Republicans in 2011. In early 2011 the Democrat controlled Senate crafted a hyper-partisan redistricting plan intended to ensure control by their party regardless of the expressed will of the voters. In spite of this effort the Republicans won control in the November 2011 election. Republican candidates for Senate out-polled their Democrat counterparts by 57 percent to 40 percent. But gerrymandered districts skewed that result, electing more Democrats than the popular vote reflected. The balance of power in the Senate now rests with its presiding officer, Lt. Gov. Bill Bolling, a Republican. Coincidently, Bolling won 57 percent of the vote in his most recent election in 2009. So while the new Republican majority may be numerically narrow, it reflects the clearly expressed preferences of the 57 percent of Virginians who voted Republican for Senate in 2011 and lieutenant governor in 2009. Virginia Senate Democrats worked hard to win concessions in this budget and they now have a choice; stop obstructing and pass this budget or continue to make non-budgetary demands and shut down the commonwealth which will undoubtedly result in a negative backlash. Is there one courageous Democrat left in the Virginia Senate? Tomorrow is election day in Virginia, and in Ohio, and like all elections, those who participate will win the future. Virginia has this peculiar phenomenon where we have an election…EVERY…DAMNED….YEAR. Yeah, it’s annoying to a large degree, BUT, we Virginians also get the opportunity to buttress the national agenda for national elections that follow the next year, so we’ll suffer through it. It was the Virginia election of 2009 that swept Governor Bob McDonnell, Lt. Gov. Bill Bolling and Attorney General Ken Cuccinelli into power that set the stage for the electoral landslide for the nation in 2010, where the Democrats lost 58 seats in the House and the nation poured water onto the circuitry of Nancy Pelosi, causing her to fizz and pop when she lost the majority. Virginia gets to tee it up again for 2012. Virginia has a state Senate that needs a fixin’. It’s time to put a major league smackdown on the Democrats tomorrow, banishing them from power and rendering them irrelevant. Not just for what’s going on in Virginia, but once again to set the tone for next year. But let’s talk about voter turnout. Remember that in the last election that didn’t have a Governorship at stake (2007) the voter turnout was around 20% of registered voters. So it really does come down to those who show up in an election like this. The Democrats are sitting ducks on a mill pond right now. Tomorrow most people will be washing their cars, fixing a leaky toilet, going to the gym, or playing angry birds. Or something. They won’t be voting. If you’re reading this blog you’re not one of those to stay home during such an opportunity, but for those in VA-09 who have the reprehensible, the detestable, the DEFEATABLE Donald McEachin as your Senator, you have the opportunity to make him the first ‘One and Done’ Democrat of the election cycle. It’s good practice for the Presidential election next year. Simply write in FLOYD MAYS for Senate. Once again, it starts in Virginia like it did back during our founding. Virginia has a special obligation to mobilize as we are represented on the American flag twice. As one of 50 stars, but also, one of the 13 stripes. We have a history of demanding good governance and when we make bad decisions in the past, we correct them.